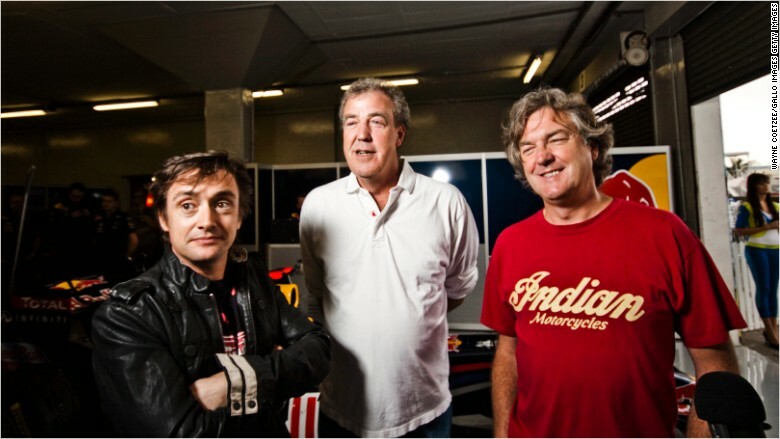 Former Top Gear hosts -- Jeremy Clarkson, Richard Hammond and James May -- have signed a deal with Amazon. "The boys" are going to Amazon. The former hosts of global TV hit "Top Gear" -- Jeremy Clarkson, Richard Hammond and James May -- have signed up to present a new car show on Amazon (AMZN). Clarkson was sacked by the BBC in March after a "physical altercation" that left a colleague seeking treatment in a hospital emergency room. The show will be produced by the trio's former producer Andy Wilman, who quit the long running series after the BBC decided to get rid of Clarkson. The three stars used their signature humor to comment on the deal. Clarkson feigned confusion: "Amazon [is] now saying I can't be their chief drone pilot. Apparently they want us to make a car show," he tweeted. Co-host Hammond said: "Amazon? Oh yes. I have already been there. I got bitten by a bullet ant." The show is the latest example of Amazon's successful move into TV shows and movies. Its breakout series about a transgender woman and her family, "Transparent," has won two Golden Globe awards and gained an international following. Woody Allen is also working on an original series for the online retailer, although he said he regretted the decision to sign with Amazon. Amazon has joined Netflix (NFLX), Hulu and other streaming services in transforming the entertainment business. The new show could strengthen Amazon's hand in the increasingly competitive market. The program was one the BBC's most valuable global brands. British media estimate that it made £150 million ($225.8 million) in revenue for the broadcaster's commercial arm in 2014. "Customers told us they wanted to see the team back on screen, and we are excited to make that happen," said Jay Marine, vice president of Amazon Prime Video in Europe. BBC is keeping the Top Gear brand. It is planning a new series to be presented by British TV and radio personality Chris Evans. Amazon said the first show will go into production shortly and will air on Amazon Prime in 2016. It has not yet revealed the name of the upcoming show.